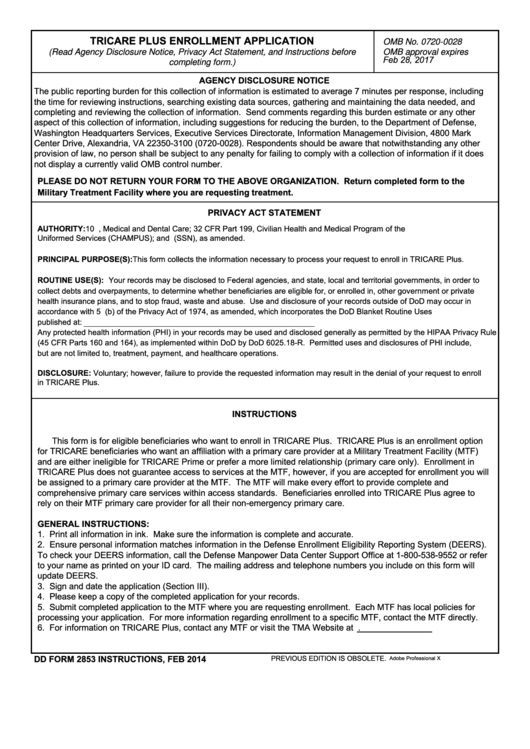 Download a blank fillable Dd Form 2853, Tricare Plus Enrollment Application, February 2014 in PDF format just by clicking the "DOWNLOAD PDF" button. Complete Dd Form 2853, Tricare Plus Enrollment Application, February 2014 with your personal data - all interactive fields are highlighted in places where you should type, access drop-down lists or select multiple-choice options. not display a currently valid OMB control number. Military Treatment Facility where you are requesting treatment. PRINCIPAL PURPOSE(S): This form collects the information necessary to process your request to enroll in TRICARE Plus. rely on their MTF primary care provider for all their non-emergency primary care. processing your application. For more information regarding enrollment to a specific MTF, contact the MTF directly.